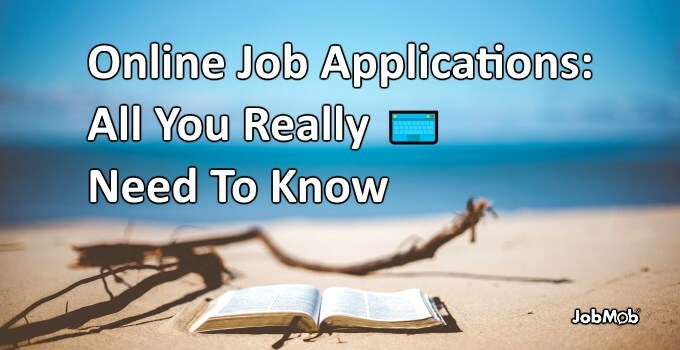 How to apply for a job online and get it. This is a guest post by Dean Giles. And some people say that applying for jobs online doesn't work. Why? Because online job application puts all of the power in the hands of the employer—and it cuts down the time and money needed to handle job applicants, because employees don't see most of the applications. How many times have you heard of people filling out dozens or even hundreds of online applications without even getting one response back? Automated systems sort and process the applications. If your application isn’t processed and brought to the top of the list of applications, it simply won’t even be reviewed by human beings. In your experience, is it possible to find a job without submitting job applications online? So the question is–what do you need to get to the top of the automated list, and get past the autobot filters designed to weed out applicants before HR or anyone else needs to spend any time on it? And… a system that works in reverse—a system that only has you apply for a job after you have gotten the response. Yes, you heard me right. To succeed with the online job application, you need only apply for the jobs that you already have a response for. The experts and gurus will tell you that you need to apply for a lot of jobs. The logic is: the chances of getting a job goes up with every application you submit. But I don't buy it. You spend hours getting the resume and application just right. You fight with the submission process, then you wait. And for what? Intense silence on the other side. Your hopes are actually dashed with every online resume that you fill out. You can't hold out real expectations when you haven't had a response from the last 35 applications you have submitted, now can you? Then pretty soon you are looking for ways how to fill out job applications out faster. You are cutting corners sending the same resume to every offer, leaving every field blank that isn't expressly required. But what will an employer see if they actually do look at that application? Someone who can't even complete a whole form? Will that application actually help your chances of getting hired, or would it just hurt them? What would your chances of being hired actually be like if you knew your application would be reviewed by a real person? How much more time and detail could you put into the application, and how much better would it be? Contemplate those questions while we address the other two things that you need to get your resume seen by real people. If you don’t have the exact keywords and phrases that the automated system is looking for, your application will fail. It is that simple. For an example, I will assume most everyone has done a Google search before. In the Google search window, a person will type in a search term and Google will deliver a list of possible sites that relate to the term that you typed in. Although the algorithms are different, the automated applicant tracking systems have, at their heart, the very same mechanisms and return to the employer’s agent, the HR person or company recruiter, a list of applications that have all of the specific keywords and phrases that they are looking for. The irony here is that many people will have the experience and prerequisites expected, but will not be in this list of top qualified candidates because the automated systems just won’t find their application. Use the job description to get the exact keywords that are being searched for. As was pointed out, the automated systems are looking for specific keywords and phrases, it is easiest to match those keywords when you are applying for jobs that you really do qualify for. But, where do you find those perfect jobs that you are looking for? Finding the right jobs requires knowing where to look, and how to get the right help finding the job opportunities. It is estimated that the big job boards such as Monster, CareerBuilder, and etc. only account for 4 to 8 percent of all hires in the US. What that means is that the majority of the jobs available are not on the big job boards. You can learn exactly where to look for the right jobs, and how to access the “hidden job market” where the competition is significantly less, and odds are much greater in your favor for getting hired. The secret is in networking and the right tactics to find the people inside that are influencers and can help you. Finding just the right job opportunities will cut down the frustration factors immensely and actually improve your chances of interviews and job offers. The process that works is actually the reverse of the common logic. Don't apply until someone there is expecting your application. Most people think that online job application means that you can’t contact the company, and that there won’t be any human interaction until you win the job application lottery and your name is chosen. Frankly, this attitude keeps most people from making the short list at the companies that they are interested in. If you have the first two things mentioned above, then you need to let a real person know it. No place is that more evident than when it comes to getting hired. As it turns out, knowing who to contact and how to contact them is a key component to becoming that known entity, and gaining a foot up on your competition. Most people go about contacting someone in the company in a completely wrong way. They hear this phrase again and again, “if they choose your resume, you will get a phone call from them.” That is usually the last thing anyone hears from the potential employer’s company. Finding the right people to contact and contacting them in the right way will make a big difference with the employer interest in your online job application. The real problems of today’s job search happen to be in the new online job application process and all of the baggage that it introduces, rather than in the lack of jobs or the current economic conditions. The prevailing system for getting hired simply doesn't work. When you reverse that equation and start by contacting someone at the company, you can start seeing results immediately. Are online job applications a necessary evil for job seekers? Tell us your online job application story in the comments. Twenty one years as a Project Manager gave Dean Giles a lot of experience on the interviewing and hiring end of the job market. One company acquisition and a subsequent reduction-in-force, put him on the opposite end of that equation. He quickly found that the automated online job application mechanisms had pretty much high-jacked the hiring processes. He found that the hiring process for most people is completely broken and that what he had learned over 21 years had to be applied in new and creative ways. Dean now strives to help people find employment and use the new technologies to their advantage. Subscribe to JobMob via RSS or email and follow me on Twitter for more great insight on filling out job applications online. One of the things the author has not identified is *why* the rise in requiring online applications. At least in the US, it has to do in large part with federal compliance guidelines that, simply boiled down, state that an employer must have an auditable process proving they are considering EVERY qualified applicant for EVERY position. The caveat is that they can only LEGALLY consider QUALIFIED individuals who express a direct interest in SPECIFIC POSITIONS. (The mandate is sponsored by the OFCCP and about 80% of US employers are subject to it.) What it means is that I, as a recruiter, cannot consider you if you don’t meet the minimum requirements. Online applicant tracking systesm s are the single easiest way to prove compliance. Thanks for providing that information, Kristen. Valuable comment, and I’d like to see more job sites communicating this information to job seekers. Do you see a reason not to? Hi Jacob, thanks for your article, interesting as usual. My online job application story is… that I have no story to tell!! Since I moved to Israel in 2016 I’ve been trying by all means to find a minimally decent mechanical engineering job, with no results whatsoever. The very few interviews I managed to get until now were arranged through someone who knew someone inside the company and decided to graciously open the doors for me. 100% of my online applications fell into the above mentioned “black hole”, even after turning my CV upside down to comply with all known tricks that would make HAL 9000 (sorry, I mean ATS) pick it from the heap and transfer it to some vaguely human being for actual reading. I guess the main factor here is – despite all PC blabber, equal opportunity nonsense spoken here – my AGE, yes! My crime is being 57 and having huge professional experience, in addition to still not speaking Hebrew fluently. For most Israeli companies, it looks like I would only be fit for sitting on a bench at the supermarket exit door and checking no one is evading with stolen products. Perhaps the reason behind this despicable discrimination may simply be… fear from competition!! But I digress – in summary, ATS and online application systems look like huge walls created by HR people to hide behind and have something / someone to put the blame on for their consistent failure to identify and hire the best candidates. I have already made the Gvahim course in order to know how the Israeli job market works, and the consultants and mentors occasionally send me some job offerings (a single interview is the net output of over 1 year period after the course). I hear your frustration. Unfortunately, you have some real obstacles to overcome such as your Hebrew level, which is a very legitimate concern at most Israeli companies. But there are many oleh-founded companies where Hebrew knowledge may not be such a big concern, and both Gvahim and Maof should know. I’ve been sending my resumes online for majority of the jobs that I applied for and I never knew that some companies use automated filters for applicants. I really learned a lot from this article. I will certainly use the tips that the article gave. As an graduating student, I am very excited to work and test out my abilities. My dream is to work in Metro Manila. I just hope that a recruiter in Makati would contact me for an intial interview. Glad to help, Sandrene. Look for people like you (similar qualifications/background) who have jobs in Metro Manila and ask them (via social media? Phone is better!) how they were hired. Obviously. Some advice as to how that can be done would make this article helpful. As it is, you are just stating what we already know.